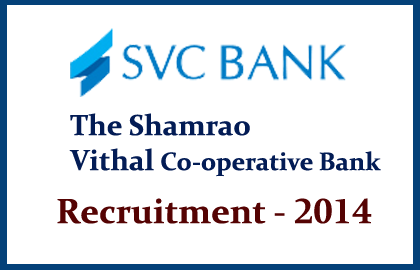 SVC Bank has announced opening for the post of Branch Manager, Assistant Branch Manager and Customer Service Officer. Eligible candidates can apply here within 15 days (From 13/09/2014). More details regarding eligibility were mentioned below. Any faculty. C.A. / I.C.W.A. / C.S. / M.B.A.
Assistant Manager / Deputy Manager / Manager of a medium / large size branch. Faculty. C.A. / I.C.W.A. / C.S. / M.B.A.
Assistant Manager of a small size branch. University with minimum 50% marks. Selection Process: Candidates will be selected on the basis of the performance in the personal interview and experience. Apply Mode: Eligible candidates should send email their application along with their detailed resume and a latest passport size photo. Your email should reach with 15 days from the date of post.